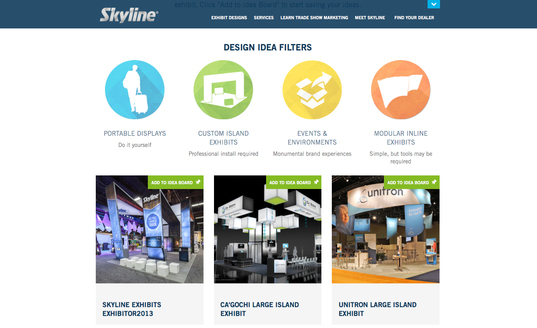 Photos, Design Ideas, Educational Materials and Easy Sharing Are at Core of Content ST. PAUL (May, 2014) – Skyline Exhibits has just gone live with a new website that gives exhibitors a valuable source for exhibit design ideas and educational materials. The site is loaded with exhibit photos, conceptual renderings, case studies and educational content like exhibiting guides, white papers and Skyline’s popular Trade Show Tips e-newsletter. New Look Supports Current Brand The site has a new look that better represents Skyline’s brand, which was recently updated. It also has an interface that makes it easier and quicker for visitors to find their content of interest. Collecting, Commenting, Sharing New to the site is Skyline’s Idea Board where visitors can create their own secure library of images from the site, add comments and share them. A simple email invitation allows access to colleagues or their Skyline dealer.